(ii) engaged in discharging ballast when ship's hold is to be cleared for cargo; as for (i), but operations reversed. a carrier q.v. engaged in unloading barges, boats or other small vessels. (East Coast term which originated when fish porters were paid 1s. per hour) see lumper, fish. a dock labourer q.v. who stands on dock quay, or in ship's hold, filling a box or similar receptacle with number of small separate packages; attaches slings to box and, when box is filled, hitches it on to crane fall, then signals to hatchman q.v. or to winchman (736) q.v. for removal of packages to hold or quay. a filler q.v., in dock shed, who fills sacks with grain discharged in bulk from ship, using an iron measure known as a bushel (drum or flat), in readiness for' weighing. a general worker (as distinct from a specialist, e.g. fish loader, grain hopperman q.v. assisting in loading or unloading of any cargoes. a porter q.v. who carries goods on back, shoulder or head between quay, ship or warehouse, or about dock premises generally; usually specifically designated according to goods carried, etc., e.g. bag carrier, deal carrier (carrying deal planks), fish box carrier, fruit carrier, pitprop, prop, or pitwood carrier, potato carrier, timber carrier. stands on gangway between ship and wharf or quay, and passes timber from a dock labourer q.v. standing on ship's deck to deal carrier q.v. one of a team of men who open and shut dock gates by means of capstan; cf. dough keeper (749). a dock labourer q.v. engaged in any filling operations, e.g. shovelling ballast, grain, in bulk into baskets or other receptacles in ship's hold or on quay in readiness for trucking away by dock labourers or for attaching to crane slings and subsequent tipping, cf. tipper; includes ballast heaver, grain busheller q.v. loads fish boxes on lorries or other vehicles at fish wharves; cf. carrier. adjusts position of hopper to emptying buckets of elevator, and moves hopper along rails during process of filling grain from ship into warehouse. stands by hatch when ship is loading or unloading and signals to winchman (736) or to railmen q.v. when to set winch in motion to raise or lower goods from or into hold; signals to holdsman q.v. when goods are about to be raised or lowered; steadies goods, with his hand, as they come within his reach on their way to or from holdsman; employed on larger vessels only. see labourer ; sometimes specifically designated, e.g. fish hobbler. a dock labourer q.v. working in ship's hold, carrying or wheeling goods to hatchway or from hatchway to stevedore and stowing them under his direction; may also detach or attach slings, dogs or hooks of hoist to receive goods, lowered into hold by winchman (736) q.v., or to unload goods therefrom. general terms for anyone engaged on the various kinds of unskilled work in a dock, such as lumping, carrying or wheeling goods from or to ships, assisting stevedores, in loading and unloading of vessels, etc. 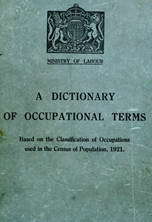 ; when employed permanently by dock authority is called dock board labourer, permanent labourer, registered or "A" list labourer; when employed casually may be a preference or "B" list labourer, who has next claim for employment after permanent men; sometimes specifically designated according to kind of work done, e.g., stevedore's labourer. a dock labourer q.v. unloading goods from lighter to ship in harbour or fairway. (iii) grades incoming merchandise according to quality, e.g. sorts cases of oranges into lots 1 (ripest, and to be sold first), lots 2, 3, 4, etc. as for carrier; generally used for men employed casually by stevedore. discharges fish from trawlers and drifters to quay; carries fish in "kits" or baskets. rolls logs of pitwood, from ship to wharf, down an inclined plane. a dock labourer q.v. who is engaged in carrying or otherwise transporting goods at docks; sometimes specifically designated according to place where employed or to goods carried, etc., e.g. canal porter, canal boat porter, corn porter, contract porter (paid per ton of goods moved), cotton porter, deal porter, dock warehouse porter, fish porter, grain porter, marine porter (carries luggage between train and ship), quay porter, quayside porter, riverside porter, sample porter, ship's porter, stone porter, timber porter, waterside porter, wine porter. a dock labourer q.v. whose work lies on timber rafts; receives logs of pitch pine, etc., from ship or barge, and makes up into rafts, by means of staples and chains, to be towed to timber pond in dock for storage. adjusts, and makes secure, a railed gangway, from ship to pier or quayside, for passage of trucks; stands by to brake trucks, when necessary, and help them over points. stands near ship rail during loading and unloading operations and signals to winchman (736) q.v. when to raise or lower goods; steadies, with his hand, goods as they come within reach on their way to and from hatchman q.v. ; employed on larger vessels only. a specially skilled dock worker employed by master stevedore (731) q.v. to rig up wire splicing, derricks, deck hoppers, chutes and other gear for loading and unloading ships; dismantles derricks, etc., when loading or unloading completed; examines wire ropes and other gear from time to time to ensure that it is in working condition. see carrier; sometimes further designated, e.g. corn runner, fish runner. a dock labourer q.v. shovelling salt from hold of ship into tubs for hoisting by crane; or filling tubs on land for loading. a dock labourer q.v. engaged in sheds of docks or harbours. a dock labourer q.v. engaged on slate quay, sorting whole from broken slates. a dock labourer q.v. specialising in carrying slates. a dock labourer q.v. who separates, with a wooden slice, bags of nitrate of soda stuck together during voyage. a dock labourer q.v. loading food supplies on steamship for victualling superintendent (739) q.v. a working foreman, taking charge, under instructions and general supervision of ganger (740) q.v. of a gang of dock labourers q.v. with whom he also works. one of a gang of dock labourers q.v. engaged in loading any kind of cargo that is shipped in bulk, from hoists or buckets; cf. coal teemer (744). at each full tide, tows or warps vessels in and out of small slate shipping harbour or dock; keeps dock gates and premises painted and in repair. (ii) as for tipper, coal (744). general terms covering all persons engaged in transport, in any capacity; usually implies a dock labourer q.v., but also covers drivers, carmen (719, 720) q.v., etc. arranges ballast in holds of ships so as correctly to balance weight, and to ensure against shifting on voyage. "trims" grain with shovel in ship's hold, so that it can be easily unloaded by grain suction apparatus; during loading, spreads rain with shovels evenly in ship's old, round stanchions, etc. a dock labourer q.v. principally engaged in unloading cargoes. a dock labourer q.v. specially engaged in handling bales of wool or other baled goods at waterside; or in repacking goods in bales for convenience in transport.